Veenam Kalapalatamarincha Varadam dakshe vidhatte karaih! Vaame tamarasam cha ratnakalasham sanmanjareem chaabhaye!! Shundaa dandala sanmrigendra Vadanah Shankhendugowraha Shubhah! 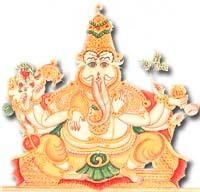 There are different forms of Simha Ganapati – in some forms He is depicted as riding a lion. In most images he has eight arms and holds – Vinshu chakra, vina, kalpa tree branch, pot, flowers and sword. One arm is in protecting posture and another is in blessing posture. It must be noted that some of the images of Simha Ganapati have striking resemblance to the Narasimha incarnation of Vishnu. Simha Ganapati form is worshipped at the famous Pandarpur Vithal Temple in Maharashtra. Meditating on this form helps in attaining courage to face problems in life. He also destroys all forms of evil thoughts.